Monseñor: The Last Journey of Óscar Romero is an 88-minute film that tells the story of the growing repression of the poor in El Salvador in the late 1970s. It is interwoven with the story of Archbishop Óscar Romero, or Monseñor as he was commonly known, and recounts the short time between his installation as archbishop of San Salvador in 1977 and his assassination on March 24, 1980. Using the power of the pulpit, Romero—who was beatified in 2015—delivered messages of hope in weekly sermons that became national events. Encouraging direct action against often violent oppression, Romero’s speaking touched millions and affected political events in El Salvador that still have impact to this day. The martyrdom of Archbishop Romero is a powerful witness to the life of a modern Christian hero. The film recounts these events through actual footage of the time and interviews with many who were there and knew the Monseñor. The film was produced by the Kellogg Institute at the University of Notre Dame. In collaboration with the University of Notre Dame’s Latin American/North American Church Concerns (LANACC), Ave Maria Press is releasing a free online resource to accompany the film Monseñor: The Last Journey of Óscar Romero. 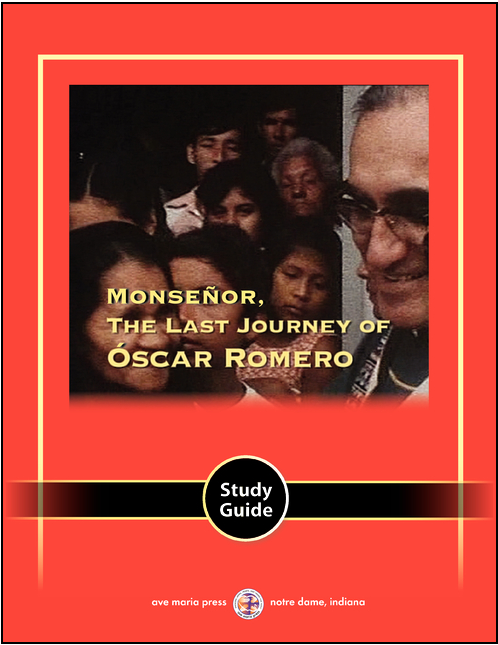 The thirty-eight-page study guide facilitates a week devoted to the study of St. Óscar Romero through viewing of the film, student research, and group discussion. The guide’s five-day plan involves an introduction to the life of Romero, viewing the film and discussing its key topics, and a synopsis of the material through the sharing of student reports and projects. This is a perfect way to incorporate a strand of social justice in virtually any course in a Catholic high school theology curriculum. The study guide also offers an adaptation for parish religious education programs. "An astonishing compilation of footage from the last three years of Romero's Life." "I urge everyone to buy this inspiring new DVD documentary." "I urge everyone to buy this inspiring new DVD documentary. It's perfect for the classroom, church groups, peace and justice meetings; for anyone discouraged by recent church developments and ongoing global wars; and anyone who wonders what prophetic peacemaking might look like. I also recommend giving copies to priests, youth groups and libraries. I wish it could be shown in every church in the nation . . . . Monseñor and the beautiful study guide that is also available are a great new resource for our work for peace and justice."